You're not going to believe this. 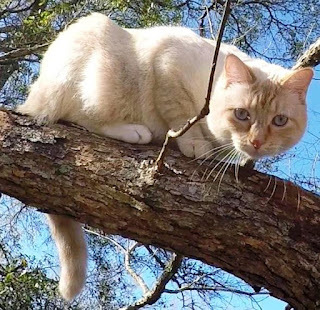 Simba got stuck in a tree exactly one day after his first rescue. The same tree. The same branch. I rescued him the first time on Sunday morning, and on Monday morning he went right back up there again. And on Monday morning, I went right back out there to rescue him again. Every rescue is different. Every cat is different, and every tree is different. Even the same cat in the same tree is different. Or so I always thought. In Simba's case, it's the same song, second verse. 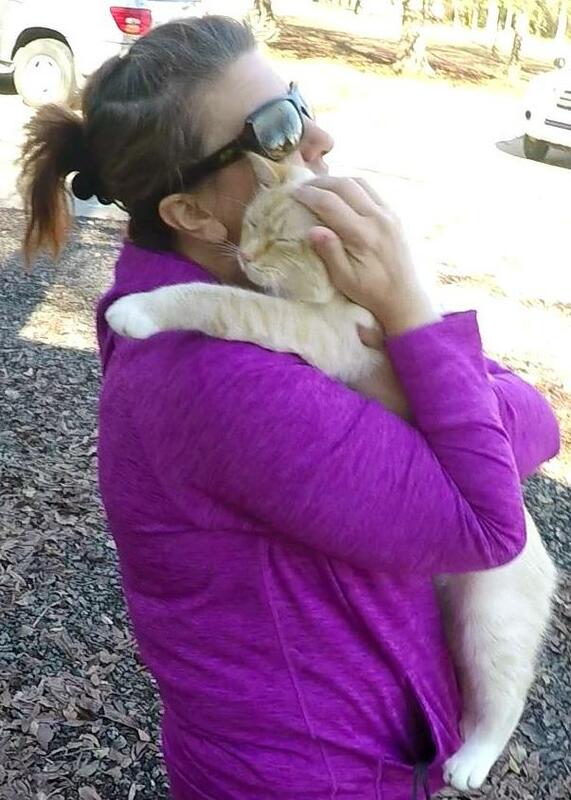 His second rescue was just like his first. 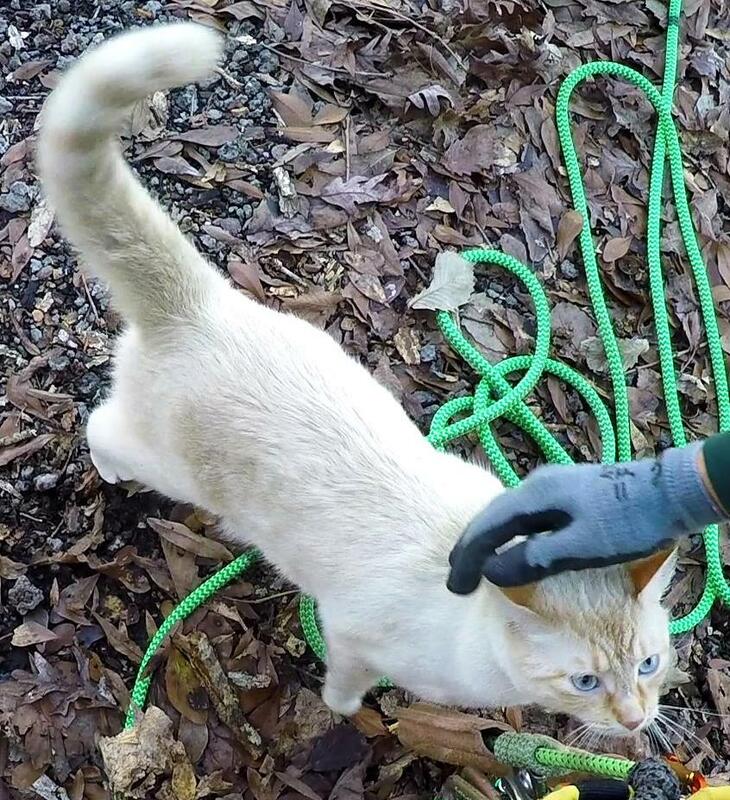 Since I knew from his first rescue that he didn't like the carrier, I didn't even bring it with me, and since he had been in the tree only a couple of hours, I knew he was not particularly hungry. This time I planned to bring him down in the bag, but I was open to letting him ride down in my lap again. I climbed up to him and found him just as friendly as the first time. We visited for a few minutes and discussed the rescue options. He seemed to want to go back down in my lap again, so that's what we did. Just like the first time, I pulled him into my lap and we went slowly down. When we were close to the ground, he jumped down the last few feet. His family is keeping him inside as much as possible, but with allergy problems, it isn't feasible to keep him inside 100% of the time. 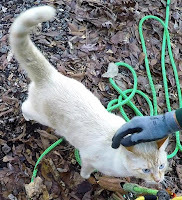 Besides, Simba loves to go visit the other neighbors, and they like for him to visit. In fact, at the beginning, three separate neighboring families all informally semi-adopted him as their own before they eventually realized they were all claiming the same cat. Simba had been not just two-timing, he was four-timing and loving it. Simba is simply at that age when he has a lot of energy to burn, and he likes to climb. So I will not be surprised if I get another call to rescue him. Maybe even very soon. But I don't mind. 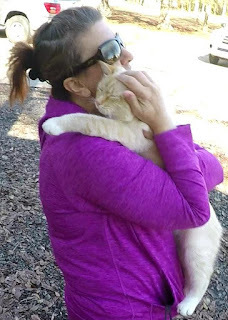 In fact, I really enjoy rescuing Simba and would be very happy to do so again. He's a fun, sociable and sweet cat, and I love spending time with him.